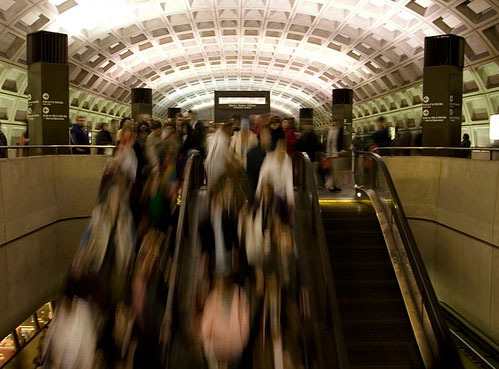 Crowds on the DC Metro system. Photo by Techne. With the average price per gallon of gas down to $1.75 – the lowest in nearly five years – it may come as a surprise that Americans continue to ride buses, subways and commuter rail at record levels. The American Public Transportation Association today announced that more than 2.8 billion trips were taken on public transportation from July to September this year – an increase of 6.5 percent over the same time period in 2007. This is the largest quarterly increase in public transportation ridership in 25 years. Meanwhile, vehicle miles of travel (VMT) on the nation’s highways declined in the same period by 4.6 percent according to the Federal Highway Administration. These trends are also notable considering that unemployment has increased (to 6.7% in November), which usually means people are less likely to take public transit. For example, during the Great Depression in the 1930s, transit patronage nationwide declined by more than 25 percent (see study: “The Factors Influencing Transit Ridership.”) A similar decline occurred among big cities that experienced job losses during the fiscal crisis of the 1970s. The Washington Post reports that today’s increased ridership could influence tomorrow’s decisions about transportation infrastructure. Indeed, APTA and the Community Transportation Association of America found that $8 billion in federal funds could start 559 “ready-to-go” projects for 170 public transit systems. “I urge Congress to move forward with an economic stimulus package that recognizes the value of investing in our nation’s public transportation infrastructure,” said APTA Chair Dr. Beverly Scott, according to a press release. “These projects will create new economic activity and put thousands of people to work.” You can read APTA and CTAA’s official policy agenda pushing for more public transportation here. Despite increased demand for public transit, the ride isn’t easy for everyone – namely, transit agencies. Tags: metro, Train, United States, Washington, D.C.